I originally made this in Sketch-up and then edited it in Google. The five towers stand on the edge of the city, opposite of the main gait. 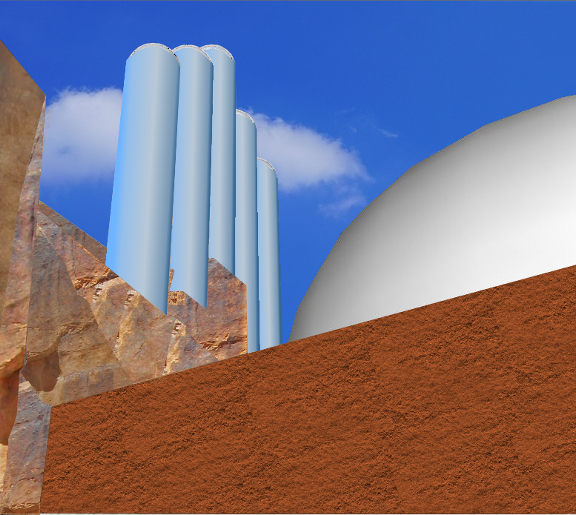 Behind them are the transport tubes acting as the wall. The history of the towers is sketchy. Some say that it was built before the genetic split between the Natisiens and Inersiens. There have been reports of them always being there, part of a city that predates known history. It wasn't covered in the rikta polymer until after the war with the Exorlaks, when the Zheroshians found a more pleasant use for the polymer and energy source than weapons. I'm afraid this is the only image I have of this at the moment. I lost the sketchup files when my old laptop crashed.